PULLING stubborn gears, bearings and other mechanical components can be a time-wasting and potentially hazardous job. When frustrated maintenance staff resort to hammers, chisels and levers, the brute force involved can also result in costly damage. In response to the need for a powerful and precise way to do the job properly, Enerpac has assembled a series of hydraulic master puller sets from 8-50 tonne capacity. Supplied with a full multipurpose hydraulic set - including pump, hose, cylinder gauge and wooden case - each set includes a grip puller, a cross-bearing puller, a bearing cup puller and a bearing puller attachment. Also incorporated is a speed crank and adjusting screw to minimise set-up time by giving fast contact to work before applying the 700 bar (10,000psi) hydraulic force. 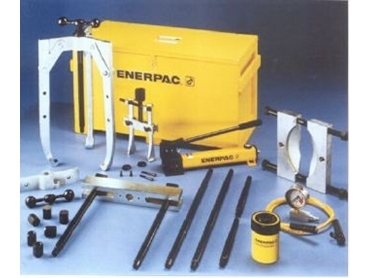 Enerpac says the high quality forged steel components of the sets provide superior reliability and service, being part of the broad Enerpac Australia range of sophisticated heavy duty maintenance, fabricationand lifting equipment. Applied Power Australia 02 9743 8988.